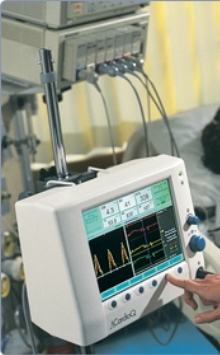 Deltex Medical manufactures and sells medical monitors that are used by doctors and nurses to help patients recover more fully and more quickly from the effects of major surgery. One of these devices is a disposable ultrasound probe called the CardioQ-ODM, (oesophageal doppler monitoring) which monitors blood volumes before an operation. Accurate monitoring ensures that the patient is provided with the correct combination of fluids and drugs before surgery, ensuring increased fitness of patients for operation, promoting rapid recoveries and therefore reducing patient stay in hospitals. Deltex’s products are sold to over 30 countries making it essential that they are manufactured to the same stringent quality standards. So it is no surprise that it turned to industry leaders, Hybrid Laser Tech (HLT) to cut the ‘business end’ of the probe, the piezoelectric ceramic crystal component for the sensor. Graham Lowe, Deltex Marketing and Operations Director, explains; “We have a long-standing and successful business partnership with HLT, which supplies critical and accurate cutting of our crystal components with high levels of consistency. HLT are specialists in laser cutting and initially advised Deltex on how to design the product for manufacture. A particular strength of the team is that it is able to start at the component level and provide input into design of an entire piece of equipment. For some clients HLT also advises on the selection of the base material and can provide support for negotiating prices with suppliers, the benefits of which are then passed on to the client. “Metal coatings such as gold or silver palladium are normally thick film printed and fired onto pre-cut bare substrates. By working closely with Deltex and the material supplier, we developed a processing system capable of cutting through the electrically poled and silver coated PZT material without affecting the material properties. © 2019 Hybrid Laser Tech - All Rights Reserved.